One of the happiest moment for me is when people say they love my wire jewelry creations. 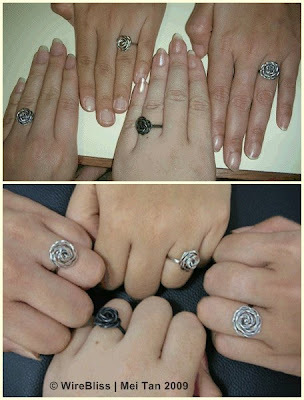 Today, Pat emailed me some pictures of her and friends modelling the rose rings and said. Mei, You must be proud seeing us modelling your rings! ahahahaha! Yes! Yes very proud and happy. Thanks for sharing Pat. It must be a wonderful feeling when someone goes out of their way to send you a photo such as these...you should be proud...your wire work is amazing!!!!! Yes its wonderful Heather. Nice to know they they like them.